WASHINGTON, DC — In this week’s address, the President and First Lady wished Americans a Merry Christmas and Happy Holidays, and thanked our brave troops for their service. Especially as our combat mission in Afghanistan comes to a responsible end in the coming days, we are reminded of all that military men, women, and families sacrifice to keep us safe. The President and First Lady asked everyone to take some time this holiday season to visit JoiningForces.gov and find out how to give back to the men and women in uniform who have given so much for all of us. 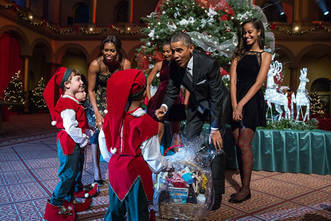 Our theme was “A Children’s Winter Wonderland“ – and Americans young and old had a chance to come together and celebrate the season.